Tales from a country Grandma: Happy happy joy joy! Ooooooh! I am soooo pleased with this lovely colour filled granny heart bunting! It has taken me a week or two to complete, but crocheting with these deliciously yummy colours has really lifted my spirits. In fact, the amount of energy and happiness I got from hooking these hearts in such lovely colours was just extraordinary. I got the pattern from the very talented Bunny Mummy, although I did make it slightly differently (wrong actually!) as the patterns are written in US terms, and I made a mistake with the UK double treble, adding in an extra stitch! Oh well, it didn't seem to matter! I do need to give it a bit of a iron, but I was so keen to see it up that I got a bit carried away. Not like me!!! 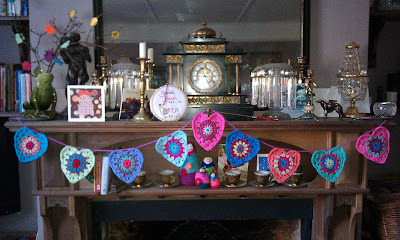 Hey Helen...just caught up with your blog....LOVE the bunting!! !